Analyst Rebecca Lindland described her drive of the 2011 Dodge Durango as "a silken magic carpet ride over the California Hills. I was floored by the Durango." SAN FRANCISCO -- If Chrysler Group is to achieve its goal of exceeding 13 percent market share by 2014, it will need more customers -- lots of them. Getting those customers will mean convincing people the company's new products are for real. The company knows it has a major education job on its hands to make people forget its sorry recent past, where poor perceived quality and bad reviews helped put the company into bankruptcy. Both Dodge and Chrysler brands have high hopes their new product offensive will boost sales and help lift the company from its current market share – about 9.4 percent. The two brands showed journalists seven new or heavily revamped vehicles here. 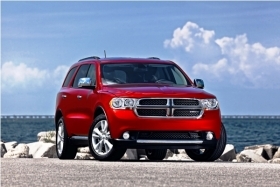 The Durango is the only vehicle that is completely new, and it shares a platform with the Jeep Grand Cherokee. The Dodge Charger large sedan is almost entirely new and shares only a floorpan with previous model, according to Ralph Gilles, Dodge CEO. Those include the Dodge Avenger sedan; Journey crossover and Grand Caravan minivan; and the Chrysler Town & Country. Though restyled modestly on the outside, all have major changes under the skin, starting with new interiors and the Pentastar V-6 engine, which replaces seven previous six-cylinder engines. Rebecca Lindland, an analyst for IHS Automotive, was skeptical before she drove some of the vehicles and found them “inspiring.” Based on her impressions, she has decided to recommend that IHS analysts raise their forecasts for Chrysler. IHS predicts Chrysler will find a stable share of about 8.8 percent between 2011 and 2014, according to forecaster Chris Hopson. As recently as 2005, Chrysler's share was 13.6 percent. Lindland described the new Chrysler 200 sedan as “very good,” but was most impressed by the Durango SUV. Lindland said she believes Chrysler will still have difficulty topping 13 percent market share by 2015, but said “I believe their market share goals are more legitimate than before” based on the new product. She said Chrysler's pricing strategy is “very competitive” and could play a key role in gaining new customers. Lindland said she liked the “culture of ownership” Chrysler employees exhibited in showing off the new products here.